Buy Adobe CS5.5 for 10% Off and Get CS6 Free — One Week Only! This is a really special promotion, and here’s why: (1) You can use it to actually buy CS6 now at a discount, even before it has been released… (2) The offer is valid internationally, and, (3) It’s also stackable with other current deals. You will receive an immediate one-time savings of 10% off orders of $375/£350/€400 or more containing full or upgrade versions of any Adobe software. In order to redeem the 10% discount, you must have the special promotion code SPRING10 applied in your Adobe shopping cart. And good news for students: the offer is valid for both commercial and education customers – meaning you can get an extra 10% off the already-discounted academic prices for orders at that level. What’s more, the coupon is stackable and may be used in conjunction with other deals – meaning you can combine it with the current $99 Lightroom 4 special worldwide, or whatever else is offered in your geography. And most importantly, you can use it in combination with the special “grace period” offer previously announced where all buyers of the current version of Adobe software now (Creative Suite 5, either suite or individual, full or upgrade) will receive a free upgrade to CS6 when it comes out, with full support… This is already a savings for many people because with Adobe’s longstanding Tiered Upgrade Pricing Policy, it’s fewer steps and lower cost to upgrade to CS5.5 than to CS6. Note this includes buying Photoshop CS5 now with the savings, and then automatically getting the final version (not just the beta) of Photoshop CS6 at no additional charge. For this 10% off bonus promotion, orders must be placed at the Adobe Store by Sunday, April 15th, 2012, at 11:59pm PDT. This offer is available to customers in North America, Europe, and South Africa*, with one discount per customer. It’s not valid for Adobe Volume purchases, though you can still buy multiple copies and the sale will apply to everything in your cart. As always, you can download and try out any product you like for free, and then convert the trial to a permanent version using this offer if you like. – Ireland, Belgium, Luxembourg, Netherlands, Finland, Portugal: 10% off orders of €400 or over. – Denmark: 10% off orders of DKK 3,300 or over. – France: 10% off orders of €400 or over. – Switzerland (FR) 10% off orders of CHF 650 or over. – Switzerland (DE): 10% off orders of CHF 650 or over. – Germany/Austria: 10% off orders of €400 or over. – Spain: 10% off orders of €400 or over. – Sweden: 10% off orders of SEK 4 450 or over. – Italy: 10% off orders of €400 or over. – Poland: 10% off orders of €400 or over. – Czech Republic: 10% off orders of €400 or over. Offer available April 9th – April 15th. See complete Terms and Conditions. Hmmm… while I appreciate the gesture, I think the wording is misleading – you should say up-front that the 10% discount applies only to purchases over a certain amount. So yes, you can use it to buy Photoshop, and yes you can use it to buy educational discount applications, and yes you can “stack discounts”: however you can’t stack the edu discount and this offer to buy Photoshop, as that falls below the threshold. In fact, the only education product which looks like it could possibly qualify is the Creative Suite 5.5 Master Collection Student and Teacher Edition, whereas the promotion appears on the face of it to apply to all products in the education range. Hi Simon, thanks for your thoughts. The minimum order level is given right near the top in the third paragraph. And while a purchase of just the Photoshop CS5/CS6 Student Edition by itself might not qualify, if you added other software (or bought an academic suite instead) you could receive the additional discount. Also, almost all of the CS5/CS6 suites or upgrades – either for commercial or education – easily make it over the cutoff. So it’s definitely not just for CS6 Master Collection – all of the Premium suites qualify by themselves and will get an additional 10% off. Apologies if that wasn’t clearer and hope this helps. Lastly, all offers generally have their own requirements and these deals are stackable so long as each offer’s terms are met. Statistically, most people are buying or upgrading suites anyway, so this applies to most customers. 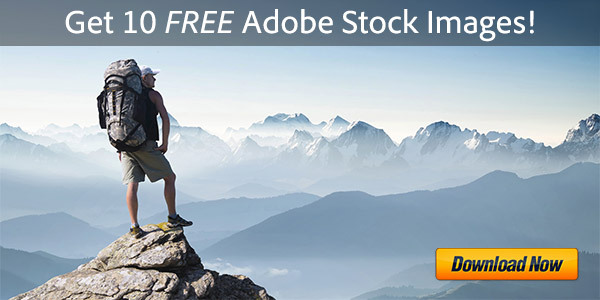 Bottom line, this remains an unprecedented deal from Adobe – a first-ever “Prerelease Sale” effectively. 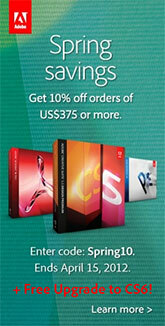 And even if you can’t get the additional 10% off, almost all customers will still receive the free upgrade to CS6. And that free upgrade offer is quite valuable by itself, because you’ll pay less to go from (for example) a CS5 Design Premium suite to CS5.5 today than it will cost to upgrade direct to CS6 next month – because the greater the number of steps, the greater the cost. thanks man you just saved me 190$ on cs6! You bet Redspa, thanks for letting us know and glad to help. This sounds like it may be a good option for me as I want to upgrade from two standalone CS5 products to Production Premium CS6. However, I heard a rumour that if CS6 is obtained this way, the user will NOT be entitled to future minor updates and bug fixes. Can you confirm if this is true? My other question is I know the CS6 upgrade is supplied in download form but would I initially receive CS5.5 in the retail box? Welcome Paul, thank you for your questions. Where did you hear that rumor, the first bit? It is absolutely untrue – through this offer you will receive the standard and complete CS6 product like all other owners, and will be entitled to full support, updates, and fixes. We’re 100% sure on that, but please feel free to confirm with Adobe if you have any doubt. On your second question – you absolutely can purchase CS5.5 now in either boxed or download form, it’s your choice – and both options will receive 10% off with the promotion code. Hope that answers what you wanted to know, but please feel free to post back with any additional questions! I would love to take advantage of a 10% reduction in the purchase of a CS5 –> CS6 upgrade but that is not what is being offered here: the 10% only applies to people who buy CS5.5 today making them eligible for a free upgrade to CS6 when it comes out. Thanks for your thoughts Allen. Yes, by and large the offer is designed for folks with older releases, those who are not running the current version(s) of the software. So people like you who already own the most recent applications might think you can’t use it. In other words, say you already own the CS5.5 Design Premium suite. You could definitely use this promotion to buy the suite upgrade from CS5.0 to CS5.5 for 10% off. Now, you wouldn’t actually install that download but later Adobe would automatically send you a free upgrade from CS5.5 to CS6 – which is what you really are after and will install and use permanently. Sound unusual? Perhaps, but it will still work. The same would go for Photoshop CS5. Even if you already own that, you could still buy the Photoshop CS4 –> CS5 upgrade now, and later receive the free further upgrade from CS5 to Photoshop CS6. That’s what you want, so just install that over your current PS CS5 and you’d be set. 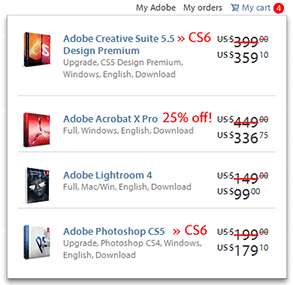 If you wait until CS6 is officially released, this discount will be past. So really for everyone – including those still running CS2 or older, CS3, CS4, CS5.0, or nothing at all – it’s a unique upgrade offer that’s never been done before. Dear ProDesign, I hope you don’t mind me double-checking! I am currently the proud owner of Photoshop CS5.5. I ask Adobe for a CS5.0 to CS5.5 upgrade which Adobe accepts to sell me with a 10% discount when I give them the magic word, and then I wait for CS6 to come out, whereupon Adobe informs me that I can upgrade my CS5.5 to CS6 at no extra cost? And everyone is happy? There’s no Catch 22 somewhere? Oh but there is, isn’t there – I forgot you’ve got to spend €400 to benefit from the discount – I’d have to buy 2 upgrades ! So it’s not going to work for me after all. Too bad! Thanks for your help nonetheless. You’re close Allen. Actually there isn’t a CS5.5 version of Photoshop, there’s only a Photoshop CS5 – that’s what you own. So you’d buy a Photoshop CS4 to CS5 upgrade with the voucher code, Adobe would gladly take your discounted payment, and yes, everyone would be happy. Then you’d automatically receive a free Photoshop CS5 to CS6 upgrade in May. The one point, which is different from what you originally asked, is the minimum purchase level… A one-step Photoshop upgrade right now costs $199/€249/£159 – so yes, you’d have to pick something else up – something else you could use, another product or upgrade, a suite bundle, perhaps Lightroom 4 for $99, Acrobat X for 25% off, or Elements 10, maybe a software gift for someone, etc., to get there. But that’s a different question, and anybody buying or upgrading to a suite would almost always qualify. Thanks again for stopping by and hope we’ve helped clarify how it works! So just to confirm, If I buy Photoshop CS5 Extended Student Edition for $199 today, I will get Photoshop CS6 for free when it comes out later this year? I just want to make sure I don’t have to buy the whole creative suite to get the free Photoshop upgrade. Thanks for clarifying! Welcome Michele, thanks for your question. The answer is… yes – absolutely, positively, definitely you will get the complimentary upgrade when buying just Photoshop! It’s not just for suites. Almost all purchases of current Adobe Creative Suite 5 products now – either suites or individual tools, whether education or commercial – will automatically receive free upgrades to CS6 next month. There are some small exceptions in the grace period terms, but yours is not one of them. The offer certainly includes Photoshop CS5 and Illustrator CS5, and the CS5.5 versions for all the rest of the applications. And that’s a lock whether you get the extra 10% off or not. Hello Johan, one thing we’ve learned after being an Adobe Partner for 5+ years is that it’s never possible to set or announce dates on deals that will make everyone happy… No matter what the company chooses, by definition there will always be someone just before or just after. So pleasing everyone all the time is unfortunately not possible. Although, you actually did get a good deal because you will receive a free upgrade to CS6, whereas the customers who bought a week or so before you will not… That grace period was announced and went into effect on March 26th. You also saved money because your upgrade from CS5 to CS5.5 (with CS6 being free) was fewer steps and less than it would cost you to move from CS5 to CS6 when it comes out. In any event, keep in mind that Adobe always maintains its 30-Day Money Back Return Policy – so that is the safety net if anyone is unhappy with their purchase for any reason. But you would have to decide if it was worth it to go through that. Anyway, thanks for checking in and hope CS6 takes you where you want to go! Firstly any discount is good news. Thanks for drawing our attention to this – I certainly wouldn’t have known about it if you hadn’t ! My personal, though not unique, situation is that I only use Photoshop and Lightroom (no point me biting off more than I can chew). I just upgraded to LR4 a week ago so in any case it’s too late for me, though not, I hope, for many others. Even if I hadn’t updated though the sums don’t add up for people like me – Photoshop + LR4 = €249 + €77 = €326 < €400. So, this seems to be targeted for people who are not upgrading but buying something for the 1st time. So much the better for them! Thanks again for your explanations. I'll get out of the way now ! Hello again Allen – you’re correct that folks who are just upgrading a single tool wouldn’t be able to make the minimum purchase level to get the extra 10% off. But, most people who are upgrading multiple applications or a suite would qualify… Adobe says the majority of customers fall into the latter category – in fact over 70% of their CS5 sales are for suites. And as you point out, most first-time buyers would also be able to use the coupon above for the additional discount. But regardless, all buyers now will receive CS6 automatically when it’s available. Good luck, we’re sure you’ll still really enjoy Lightroom 4 and Photoshop CS6! Does this mean you receive CS6.0 and then no updates as they find bugs to correct? I understand you always must pay for “upgrades” (like 5.0 to 5.5), but normally all “updates” before the “upgrade” are included in the cost you paid for the suite. Very important difference between the two words. Can you clarify? Thanks! You’re absolutely right RJ on the difference between the words. Unfortunately, someone in Adobe’s marketing department used the wrong word there. It’s not correct. It is not in Adobe’s best interest to deny any customers bug fixes etc that other users will receive free through the everyday auto-updating mechanisms of the software. So, don’t worry – product updates are always freely available and you will also get all of them. If you have any doubt, just visit Adobe’s Product Updates Download Site, where every single fix, patch, and update package ever issued for any release is right there for anyone and everyone to freely access. The minimum amount is actually set quite high. Like many people I have CS5 Production suite. Upgrading it to CS5.5 falls slightly below the limit and so is not eligible. To get the discount you have to buy a full product, CS5-5.5 master collection (I assume it’s expensive enough), or upgrade from an even older version. Considering how many people are likely to be in my position, it’s a pretty limiting offer. The U.S. cost to upgrade from CS5 Production Premium (what you have) to CS5.5 (before the discount) is actually $399, which definitely is eligible. In fact, Adobe structured it so that almost every single suite upgrade from every previous release would qualify. The only exception would be CS5 –> CS5.5 Design Standard, which is US$299 (but adding in Lightroom 4 would make the limit, and LR4 itself would be 30% off). And naturally, all customers with older CS4, CS3, or even CS2 suites would be able to take advantage of the extra 10% discount as well. As mentioned above, even those that don’t get the 10% off will still automatically receive a free upgrade to CS6 in May – which by itself is a reduced price since it’s fewer steps to upgrade to CS5.5 than to CS6. Hope you can take advantage of at least one of those deals while they last, because CS6 is not likely to be discounted at all once it’s released. Placed my order today, and bumped myself up from Design Premium to the Master Collection. Looking forward to making money with the print side, and having fun with the video side. I guess they’ve decided European customers shouldn’t be eligible for this. In the UK the price of CS5-5.5 production suite is £317+VAT. (£380 in total). The limit for the offer is £350 ex vat. Thus it falls £33 below the discount. Only the master suite is expensive enough to qualify as an upgrade only. But everywhere else in Europe, upgrading a suite will get you at or over the limit in euros. Not sure why the pounds cutoff is higher than the rest, relatively speaking – sorry about that! You could still do it, but you’d have to pick up something else – a book or two, Lightroom 4, Elements 10, etc – which would almost pay for themselves with the saved money from the discount. Apologies again and good luck – thanks for clearing that up! Cheers for the info. On the verge of putting in my order. Just one thing: Are you 100% sure that this offer also includes the free update to CS6? Just made me wonder and would like to be sure about it, if you have solid info about the situation. Hope you can answer my question before the timer runs out.. :) Thanks. Thanks for double-checking Rinne. Yes, absolutely, positively all orders now of CS5 or CS5.5 direct from Adobe (full or upgrade, any amount) will receive the free upgrade to CS6 auto­matically when it ships… it’s a lock. There is no doubt, it is 100% certain to happen for your Adobe order today… and all direct orders from March 26th through May 6th, 2012. Here are the details the free upgrade program and here are the specific terms on their website. Yes, you are taking advantage of two offers – the 10% discount plus the grace period. But you are not combining them actually – they are happening independently, at different times, and through different mechanisms. Have no doubt – you will receive Creative Suite 6 next month, and you will receive full support and updates with it. We have been Adobe Partners for over five years, and have cleared and confirmed this with them – otherwise we wouldn’t post and publicize it here. And feel free to confirm it with them yourself if you want. But it’s a great deal and savings, so we really want to tell everyone: Enjoy CS5.5 …and CS6! PS – If there’s still any question, just keep in mind Adobe’s longstanding Money Back Guarantee Policy – which says that you can return anything you buy within 30 days for a full refund and then get another (newer) product instead if you want. That’s your insurance policy and why the company is doing this proactive grace period now. Greetings Vladimir, each geography has its own written terms. However, the offer is definitely valid in many countries internationally – including throughout Europe and even South Africa… Sorry to say that Asia and Australia are excluded for the 10% discount (et désolé pour nos amis au Québec aussi), but are all included for the free upgrades to CS6. The list of all countries for the 10%-off coupon code is given at the bottom of the article. What you need to do is visit the Adobe Store Selector and then select your country, then follow the instructions above. Thanks for your comment and you have any further difficulties, feel free to post back. Thanks for your answer. I am from the Czech Republic and definitely the code SPRING10 is not valid for my order. I put CS 5.5 into the basket and when I tried to fill in the promo code I received a message: “Invalid promo code.” I am not aware of any mistake on my side. That’s very strange Vladimir. The Czech Republic is definitely one of the countries on the list… Are you sure your order is 400€ (before VAT) or higher? If it still doesn’t go, just contact Adobe Customer Service and see if they can help you work through it. In the meantime I did some “research” and it depends how I log in… In our localized Adobe store it works. HOWEVER there is a higher VAT 23%. Mistake on their side. It should be 20%. I have a few hours to think about it. Thanks a lot for your help. Sure Vladimír, glad to hear you got it figured out. Sorry to hear the VAT rate is off a bit, but if it costs 3% to save 10%, maybe it’s worth it – plus you might try to adjust it with Customer Service later. Also since you’re upgrading a suite, it will cost less to move to CS5.5 now (with the free upgrade included), than to wait and pay the full additional step to CS6 later! Thanks for following up to let us know, and best of luck with it. I ordered the upgrade from CS4 DP. I got a 10% discount, free delivery, and the free update for CS6. Thanks for circling back with the news of how it worked out, and hope to see you again soon! What’s New in CS6: Premiere Pro, After Effects & Audition Features! What Are the Differences in Photoshop CS6 vs. CS5 — What’s New?